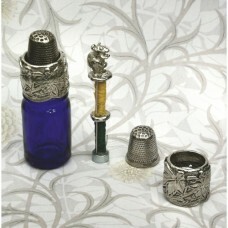 A beautiful selection of thimbles for use or to collect. Beautiful 18ct Gold Plated thimbles in small, medium and large. .. The Sewing Compendium contains a Thimble, Double reel for cotton and Needle storage, Prussian Blue c..